What do the Chivas Venture 2016 entrepreneurs wish they'd known when they were younger? 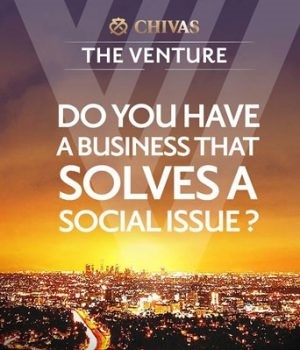 Chivas Regal, the world’s first luxury whisky, has selected the South African Top 5 for The Venture IV, a global social entrepreneur competition to find and support promising entrepreneurs from across the globe who want to Win the Right Way, by changing the world for the better. The South African finalists stand a chance to represent the country in the international version of the Venture, and win their share of $1 million. Hands of Honour, a company started seven years ago by social entrepreneur Paul Taliaard who was inspired to make a difference when he was unemployed and standing in a queue in a soup kitchen. Hands of Honour upcycles obsolete stock into furniture for under-resourced schools, and has transformed 70 negative spaces into productive places. Hear X Group is the world’s first smartphone-based hearing test, and has the potential to reach millions of people across the world who have undiagnosed and treatable hearing loss. Professor De Wet Swanepoel, who devised the system, calls this an invisible epidemic. His app uses low cost Android technology and is designed to be accessible to people who may not be able to read. Solar Turtle was devised in response to the high level of cable theft as well as increasing unemployment in rural communities. Lungelwa Tyali, COO and co-founder of Solar Turtle, says it is essentially a business in a box which allows small kiosks to be set up to provide electricity to communities. During the day, the solar panels open out and at night, like a turtle, they retract into a secure, automatically locking ‘box’. SpazApp solves the problem experienced by many spaza shop owners: wholesalers do not deliver small orders and going to purchase stock is time consuming and costly. The app, devised by Tim Strang and Byron Verreyne connects the formal and informal markets, grouping shops in the same area and making it possible for small shop owners to benefit from bulk buying and deliveries. Vehicle Energy Harvesting Systems is a concept that was sparked when Clement Mokoenene watched an aeroplane landing, and started thinking about the pressure and heat that was generated. He realised that any energy generated could be harvested, and converted into electricity. His system does just that, and has the potential to generate low cost electricity which could be accessible in even the most rural communities. “Each of these finalists are proof that sustainability, enterprise and profit can be a strong force for good. “As a brand that believes generosity and success go hand in hand, we remain committed to empowering entrepreneurs who use their businesses for real social impact,” concludes Reeves. The finalists will now pitch their businesses to an expert panel of local judges, who will offer advice and decide which finalist has the most promise to be the local winner and continue to the global final.